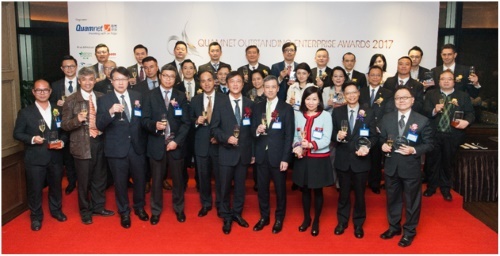 HONG KONG, Jan 23, 2018 - (ACN Newswire) - The Quamnet Outstanding Enterprise Awards 2017 (QOEA) award presentation ceremony, organized by Quamnet, was held on 18 January 2018 at The American Club in Hong Kong. Representatives of awarded companies, distinguished guests, business elites gathered to honor the remarkable achievements of outstanding enterprises. Quamnet has been organizing Quamnet Outstanding Enterprise Awards (QOEA) since 2009, committed to appraising outstanding enterprises for their success with rigorous assessment. Remarking its ninth year, with the theme of "Dedication to Achievement", QOEA aims to acknowledge and recognize all winning companies for their devotion in making remarkable achievements and thus creating values for Hong Kong economy. A total of 23 awards were presented in recognition of the achievements of enterprises covering different sectors and industries. Among the winners, 14 enterprises awarded in the previous years, won the awards again, including Agile Group Holdings Limited, The Bank of East Asia, Limited, Censere Group, China CITIC Bank International Limited, China Construction Bank (Asia), China Life Trustees Limited, Chow Tai Fook Jewellery Group Limited, CITIC Telecom International CPC Limited, K. Wah International Holdings Limited, Kerry Logistics, Macquarie Capital Limited, New World Development Company Limited, Transamerica Life (Bermuda) Ltd, Yuexiu Transport Infrastructure Limited. Meanwhile, 9 enterprises were awarded for the first time, including China CITIC Bank International Private Banking, China LotSynergy Holdings Limited, China Unicom Global Limited, Dah Chong Hong Holdings Limited, Dah Sing Bank, Limited, E Fund Management (HK) Co., Ltd, HNA Group (International) Company Limited, Shanghai Pudong Development Bank Co. Ltd. Hong Kong Branch and Union Medical Healthcare Limited. At the ceremony, Mr. Stacey Wong, Chief Operating and Risk Officer of Oceanwide Financial Group, said, "With this year's theme of "Dedication to Achievement", we strongly believe that enterprises have shown their determination to achieve success and creating values for business community and society as a whole with their capability and commitments in sustainable development." Meanwhile, Mr. Chris Wu, Chief Financial Officer of Oceanwide Financial Group, appreciated the support from award presenters, added, "The Awards have set a benchmark for both the industry and the business community to become aware of the efforts of the awarded companies, in turn, it enhances Hong Kong's long-established image of business and financial center in the world." Quamnet was honored to invite Ms. Lee Sai Yin Jeanne, JP, Chairman of The Hong Kong Securities Professionals Association, Dr. Victor S K Lee, Executive Director of The Hong Kong Management Association, Mr. Li Chan Wing, Professional Corporate Trainer, Mr. Benny Mau, Permanent Honorary President of Hong Kong Securities Association, Hon Charles Mok, JP, Legislative Councillor (IT) of HKSAR, Mr. Vincent Tang, Associate Director-General of Investment of InvestHK, Dr. Gordon Tsui, Vice Chairman of Hong Kong Securities Association, Mr. Mike Wong, Chief Executive Officer of The Chamber of Hong Kong Listed Companies, as our guests of honor to witness the glorification of the outstanding enterprises. Ms. Lee Sai Yin Jeanne, JP said she was pleased to attend the award presentation ceremony. She added, "To accomplish great things amid the competitive environment, winning companies did not only act, but also dreamed for a better scope of opportunities." Dr. Victor S K Lee was pleased to witness the growing number of enterprises being acknowledged by this Awards, which definitely enhances the reputation of the business community in Hong Kong. Mr. Li Chan Wing noted that the award recipients, showcase the diversity of Hong Kong's economy and ample opportunities. Mr Benny Mau, stated "I am glad to witness the awarded companies this year have demonstrated their strong competitiveness and determination to success among the industry peers." Hon Charles Mok, JP , said "Not only does Quamnet Outstanding Enterprise Awards offer a grand occasion to celebrate the remarkable moments of these awarded companies, it also provides a valuable opportunity for the industry peers to learn and to strive for a better future together." Mr. Vincent Tang, Associate Director-General of Investment of InvestHK said he is excited to find that some winners have long been established in Hong Kong, that have been leading the business community and the society to hold on together to a brighter future. Dr. Gordon Tsui, added "Awardees this year has shown their determination and dedication in business innovation, market intelligence, capital expansion, corporate governance and sustainability, that they have motivated the society to move forward on a path toward greater developments." Mr. Mike Wong, said enterprises in Hong Kong are reputed for their swiftness in adapting to the fast-changing business environment, reflecting their flexibility and ability in identifying new business opportunities. With flexibility and promotion on upgraded brand promotion, Agile have significant performance in providing comprehensive living services in line with real estate policies in China. Agile celebrated 25th Anniversary in 2017 and it marked the extensive presence in the diversified business development of multi-dimensional services. The results have been extraordinary and it sets a new benchmark for the China real estate market. Mr. Samson Chan, Senior Manager of Investor Relations and Corporate Affairs of Agile Group Holdings Limited, was pleased to tell that the company has been awarded Outstanding China Real Estate Enterprise again, he stated that the Company will adhere to focus on property development supported by a diversified range of businesses, and dedicate to offer comprehensive lifestyle solutions for the society. China CITIC Bank International's Multi-Dimensional Development Aspiring to be the "China Bank of Choice"
China CITIC Bank International has long been providing professional integrated banking and wealth management services and is committed to delivering comprehensive wealth management and succession solutions. With their excellent services, China CITIC Bank International is awarded two awards by Quamnet Outstanding Enterprise Awards, namely Outstanding Private Banking Service 2017 and Outstanding Wealth Management Bank 2017. Mr. Alfred Lau, Deputy General Manager & Head of Investment Advisory, Private Banking Management, said "it is our pleasure to be honoured. Both Private Banking and Wealth Management are the main focuses of our business. The awards definitely was a recognition of the company's contribution in the past year, further motivated us to reach higher in the future. We will continue its progress and pursue to be the 'China Bank of Choice'". As a long-established trading and distribution company in Greater China and Southeast Asia, Dah Chong Hong has successfully provided quality products and strategic distribution solutions for nearly 70 years, creating extraordinary value for the community. Ms Kitty Fung, Executive Director and Chief Financial Officer of Dah Chong Hong Holdings Limited thanked Quamnet for recognizing the company as an Outstanding Integrated Distribution and Trading Enterprise in 2017, noting that the award was a great encouragement to the company for its contribution and progress. Ms Kitty Fung, added that Dah Chong Hong will continue to strive for a better future and pursue sustainable growth on behalf of all its stakeholders. With the generous support of CITIC Pacific, she strongly believes that Dah Chong Hong will have a prosperous future in cooperation and partnership with the community of Hong Kong. K. Wah International Holdings Limited ("KWIH"), listed in Hong Kong, is an integrated property developer and investor with a foothold in Hong Kong, the Yangtze River Delta and Pearl River Delta regions. Its property projects are built with an uncompromising standard to excellence and quality. This year, KWIH garnered the Outstanding Corporate Governance Award for the 2nd consecutive year in recognition of its outstanding achievements in maintaining a high standard of corporate governance and reinforcing proactive and regular stakeholder communication. The Group called off its 2017 interim results announcement press conference and investor presentation as a typhoon signal No. 10 happened to batter the city right on the day. Nevertheless, thanks to a team of experienced staff members who reacted timely enough to formulate a contingency plan beforehand - and that enabled a smooth board meeting via teleconferencing and the Directors had no physical or geographically constraints to obtain an agreement on the interim results. In the meantime, the Group also maintained close communication with the investor and media sectors so as to disseminate the key messages in a timely manner. Macquarie has a long history of participation and presence in the warrant markets in Hong Kong. Embracing its 20th year of issuing warrants in Hong Kong with a solid foundation locally, Macquarie's businesses of warrants and CBBCs have been widely present in many Asian markets such as Singapore, Thailand, Malaysia and Taiwan, enhancing its leading position in Asia markets. Cater to investors seeking for convenient and efficient information, Macquarie keeps abreast of the time and actively explores e-business services by electronizing investing information. Macquarie aims to provide more instant market trends and allows investors to obtain the most up-to-date information. Meanwhile, Macquarie offers various e-platforms for warrants and CBBCs, including websites, apps and social media. This makes it a warrant issuer which offers the most-diversified investing information among its peers. Nowadays, banks in China are actively looking international development to enhance its competitiveness and global image. The Hong Kong Branch is Shanghai Pudong Development Bank's (SPD Bank) first overseas branch, which is a milestone of the cooperation between Shanghai and Hong Kong. It also demonstrates SPD Bank's resolution of going global. Ms Zhang Li, CEO of SPD Bank Hong Kong Branch, feels honored that the branch has been awarded the Outstanding International Banking Services 2017 by Quamnet. She sees the award as a recognition of SPD Bank's global development and sincere services to customers. Zhang Li said, "2018 is the 25th Anniversary for SPD Bank and with the opening of overseas branches in Singapore etc., SPD Bank will accelerate its pace in international development. In the future, SPD Bank will operate with innovative ideas in financial business, making good use of the opportunities between Shanghai and Hong Kong, fulfilling the financial demand of overseas clients and supporting them to explore more business opportunities. In addition to a strong lineup of guests, the award presentation ceremony attracted numerous media and sponsors both in Hong Kong and China. Our supporting media partners include our supporting media partners include Metro Daily, Economic Digest, The Standard, JRZJ.com, p5w, Caiguu, CNFOL, CEOFX, StockStar, EastMoney, FXGold, and TOP NEWS. The prizes and product sponsors include Adrien Gagnon, Canon, EyeCare HK, FX Creations, Impact Mints, Numismed, OneHealth and Wing On Travel. 21. Outstanding Life Insurance Company 2017 / Transamerica Life (Bermuda) Ltd.
Group photo of Oceanwide Financial Management, Guests of Honour and Sponsors.